Introduction: Gastroesophageal reflux disease (GERD) can manifest with both typical (heartburn, regurgitation) and atypical symptoms (cough, hoarseness, wheeze). While it is well established that antireflux surgery is effective in relieving typical symptoms, it is currently unclear whether atypical symptoms foreshadow a less satisfactory outcome following laparoscopic antireflux surgery (LARS). 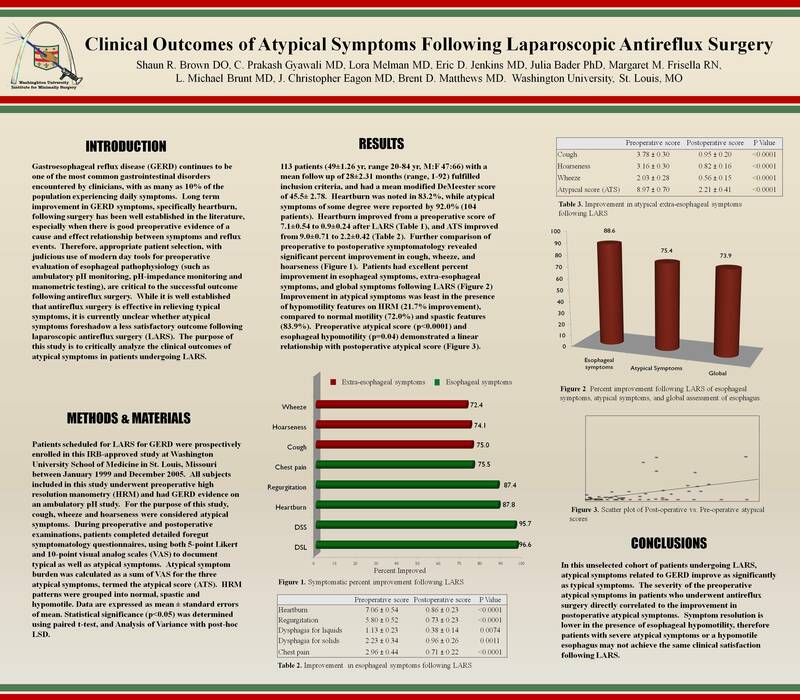 The purpose of this study is to critically analyze the clinical outcomes of atypical symptoms in patients undergoing LARS. Methods: Patients scheduled for LARS were prospectively enrolled in this IRB-approved study over a 5 year period. All subjects included in this study underwent preoperative high resolution manometry (HRM) and hadevidence ofGERDon an ambulatory pH study. For the purpose of this study, cough, wheeze and hoarseness were considered atypical symptoms. During preoperative and postoperative examinations, patients completed detailed foregut symptom questionnaires, using both 5-point Likert and 10-point visual analog scales (VAS) to document typical as well as atypical symptoms. Atypical symptom burden was calculated as a sum of VAS for the three atypical symptoms, termed the atypical score (ATS). HRM patterns were grouped into normal, spastic and hypomotile. Data are expressed as mean ± standard errors of mean. Statistical significance (p<0.05) was determined using paired t-test, and analysis of variance with post-hoc LSD. Results: 113 patients (49±1.26 yr, range 20-84 yr, M:F 47:66) with a mean follow up of 28±2.31 months (range, 1-92) fulfilled inclusion criteria, and had a mean modified DeMeester score of 45.5± 2.78. Heartburn was notedby 84.1% of patients, while atypical symptoms of some degree were reported by 92.0% of patients. Heartburn improved from a preoperative score of 7.1±0.54 to 0.9±0.24 after LARS, and ATS improved from 9.0±0.71 to 2.2±0.42. Further comparison of preoperative to postoperative symptomatology revealed significant improvement in cough, wheeze, and hoarseness. Improvement in atypical symptoms was least in the presence of hypomotility features on HRM (21.7% improvement), compared to normal motility (72.0%) and spastic features (83.9%). Preoperative atypical score (p<0.0001) and esophageal hypomotility (p=0.04) demonstrated a linear relationship with postoperative atypical score. Conclusion: In patients undergoing LARS, atypical GERD symptoms improve as significantly as typical symptoms. Symptom improvement is significantly lower in the presence of esophageal hypomotility, therefore patients with severe atypical symptoms or a hypomotile esophagus may not achieve the same clinical satisfaction from LARS.